14 schools took part in the week of graduation ceremonies hosted by Middlesex University for the national initiative "Children's University'. Designed to raise aspirations among young people, the scheme encourages five to fourteen year-olds to try new experiences, develop new interests and acquire new skills. Over the last year, the young people have recorded the number of hours of extra-curricular activities they’ve participated, including sports, volunteering and schools clubs, and noted this in their Passport to Learning. Starting with Bronze for 30 hours and going up to a Gold Fellowship for 1000, children were rewarded for their hard work through a multi-level award system. 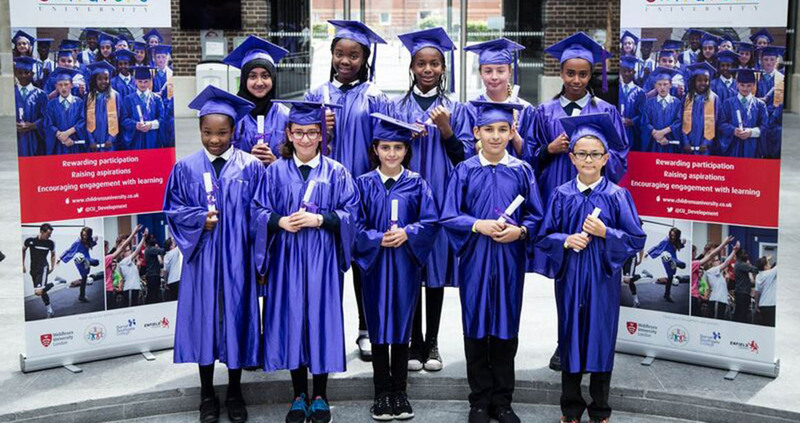 To celebrate their achievements, the children dressed in purple gowns and mortarboards before taking to the stage on Tuesday, Wednesday and Thursday to receive certificates and in some cases, medals. "I am so proud of all the children who have taken part in Children's University. Their stories and performances, showcased at the events, were both inspirational and entertaining,” said Glinys Hilborne, Enfield Children's University Project Manager. Across the three days, storyteller Tony Dallas attended as a special guest where his unique blend of interactive storytelling inspired children, parents and teachers alike. “All of the students who attended had achieved a great deal, and we hope they continue to embrace learning,” said Tim Whittlesea, Education Liaison and Communications Officer.